Mobile Mapping Market size was estimated to be over USD 14 billion in 2017 and is anticipated to grow at a CAGR of more than 15% over the forecast timespan. The mobile mapping market is driven by the increasing demand for terrestrial mobile mapping in telecommunication and transportation. Mobile mapping has been widely used among the organizations for asset management, fleet management, construction, and maintenance of cable network. Earlier, the data was acquired by the aerial photogrammetry methods. However, the process of acquiring the data via aerial photogrammetry is a very time-consuming and costly process. This encourages the organizations to opt for mobile mapping to acquire geospatial data. The low delivery time and low cost of the mobile mapping as compared to the other methods are the factors that augment its demand in the mobile mapping market. The improved network connectivity across mobile devices and the widespread adoption of mobile maps across various mobile devices have fostered the growth of the mobile mapping market. The advent of the 4G technology has improved the data transfer speeds significantly compared to the earlier generation’s 3G networks. The enhanced network connectivity has allowed users to efficiently access mapping solutions on their smartphones for navigational purposes. However, the growing concerns regarding the data accuracy of the technology have restricted the mobile mapping market demand. In GIS applications, the primary basis of classification and abstraction is based on the real-world phenomena. The users decide the amount of information to be used and its classification into various categories. Nevertheless, the users sometimes misclassify the information, reducing the accuracy of mobile mapping solutions. Hardware accounted for over 60% of the total revenue in the mobile mapping market in 2017. It includes imaging devices, laser ranging & scanning devices, and positioning devices. An imaging device is the most commonly used hardware component in the mobile mapping systems and accounts for over 40% share in the hardware market. This can be attributed to the technological advancements in the image recognition technology used in mobile mapping across construction, disaster management, and transportation sectors. The software market is expected to grow at a CAGR of over 15% over the forecast timespan. The growing demand for advanced location-based data extraction and processing software solutions for developing rich media mapping solutions is expected to facilitate the mobile mapping market share. These software solutions provide highly-precise mapping results for critical location-based data, allowing users to make informed decisions. The services market is projected to grow at a CAGR of over 15% during the forecast period. 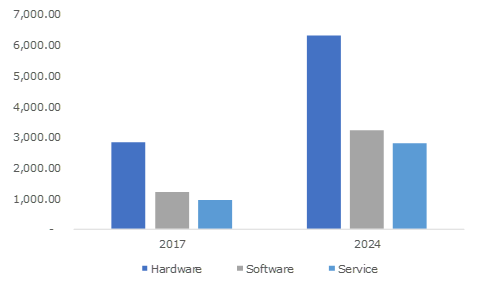 The need for effective integration between various interrelated technologies, such as GPS/GNSS systems, laser scanners, IMUs, and cameras, has driven the growth of the services market. The services ensure the smooth functioning of mobile mapping systems by offering customized service plans to the customers depending on the extent of their mapping requirements. Mobile mapping solutions are widely used by the organizations to acquire GIS data. 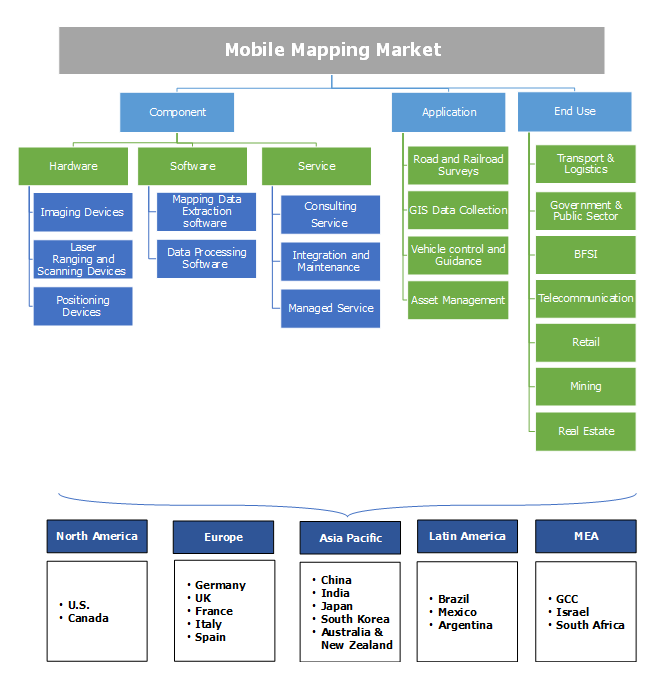 It accounts for over 70% of the total stake in the mobile mapping market. Mapping companies, such as Google, Apple, and Baidu, are heavily leveraging the mobile mapping solutions to acquire the georeferenced data and enhance the accuracy of their maps. The cost-effectiveness and the accuracy of the mobile mapping are the primary factors, augmenting the demand among the organizations. The vehicle control & guidance application in mobile mapping market is anticipated to grow at a CAGR of over 20% during the forecast period. The shift toward autonomous vehicles has increased the demand for vehicle control and guidance technologies as they allow cars to map its surrounding environment in real-time. Furthermore, the development of electric vehicle and integration of the telematics and other advanced navigation technologies into the automotive also encourage the demand for the mobile mapping solutions. The transport & logistics sector is dominating the mobile mapping market with a share of over 40% in the industry. The mobile mapping market magnification is credited to the high integration of the GPS and GNSS devices into the automotive for gathering real-time geospatial data. Moreover, the rapid urbanization and increasing population have further increased the need for effective management services across the transport & logistic infrastructure. Hence, the transportation industry is embracing the GIS technology to effectively manage, plan, evaluate, and maintain its transportation systems. The real estate market held over 20% share in the mobile mapping market in 2017. The technology has been widely used in the real estate industry as it is inherently spatial in nature. It enables the professional to measure the true impact of locations to make informed decisions regarding brokerage, appraisal, and market analysis. Furthermore, the increasing applications of the mobile mapping technology to monitor assets and infrastructure such as roads, bridges, dams, and tunnels are propelling the market growth. The North American region is projected to maintain its leadership position in the mobile mapping market with over 40% stake in 2017. The growth of the market is attributed to the large-scale adoption of GPS, GNSS, and LiDAR among industry verticals to gather geospatial data. Moreover, the presence of tech giants, such as Google, Apple, and Microsoft, in the region also fosters the market growth. In addition, the proliferation of low-cost sensors and GPS-enabled mobile devices is estimated to drive the mobile mapping market. Asia Pacific is anticipated to attain the growth rate of over 20% during the projected timeline. The mobile mapping market is driven by the growing demand for the geospatial data among the developing countries including India and China. Moreover, the increasing investments in the mapping technologies by the Chinese players Baidu and Autonavi also foster the market size. The mobile mapping industry has shown a rapid growth over the last decade. The companies in the market are forming strategic alliances and conducting fundraising activities to strengthen their product portfolio and expand their market share. For instance, in 2018, Lecia Geosystems partnered with Aibotix and DJI to build new UAV mapping & surveying applications. Similarly, in 2016, Insta360 raised a fund of USD 8 million from Qiming Venture Partners, Thunder Network and IDG capital Partners. This funding was aimed at developing advanced mobile mapping technologies. The key players in the mobile mapping market are Hexagon, EveryScape, Foursquare Labs, MapJack, Mapquest, Navteq, NCTech, Microsoft, Mitsubishi, NovAtel, Phaseone industrial, Phoenix LiDAR, Sharp Corporation, Teledyne Optech, Tom Tom International, Topcon Positioning Systems, and XIMEA. The evolution of the mobile mapping technology has been driven by the advances in the digital imaging and direct georeferencing technologies. The growing technological advancements in the internet mapping, satellite imaging, and personal navigation opened various research opportunities for the geospatial research communities. The advent of multi-sensor and multi-platform integrated technologies has accelerated the adoption of geospatial data acquisition systems. Traditionally, the mobile mapping technology was restricted to the development of applications for detecting ground elements of exterior orientation. With the steady advancements in the satellite and inertial technologies, the mobile mapping has found various applications to determine the orientation and time variable position parameters.